The sun kept trying to come out but never made a good showing but I slowed down my shutter speed to give this effect of the water just clinging to the rocks as it rushed back out to sea. I named this In The Wet Zone because I was sitting on a rock right at the waters edge - the wet zone. Waves were crashing in as I kept shooting. Acadia National Park in the evening light as the sea was deciding whether to calm down or not. 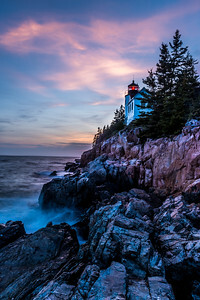 The tide was pouring in as the sun was setting along the coast at Acadia National Park in Maine. During fall foliage Acadia is one of my favorite places to be with my camera. Jordan Pond is alive iwth colors and reflections in the eveing light. The evening light baths the rocks and the foliage reflections are brilliant in the boulder edged pond.